We often find it a little easier to rise and shine in the summer months. While many people experience some form of the ‘winter blues,’ others suffer from a more serious condition known as Seasonal Affective Disorder (SAD). SAD is a form of winter depression, which according to the SAD Association (SADA), affects an estimated 7% of the UK population. Half a million people are believed to suffer from the condition which is most common in December, January and February. It can be an extremely disabling condition that limits the functionality of its sufferers who often require constant medical treatment. SAD is caused by a biochemical imbalance in the brain as a result of shorter days and the lack of bright light. Our brain is stimulated by light that enters our eyes and this light controls our daily rhythms by hormone production. For people with the condition the low levels of light in winter is not enough to regulate hormone levels. This contributes towards waking and sleeping patterns, as well as energetic or depressed feelings. Classic symptoms include feeling down and depressed, over eating, disrupted sleep, fatigue, aching limbs or feelings of heaviness, irritability or feeling tense, restlessness and difficulty concentrating. Other symptoms include stomach problems, sweating, cramps or palpitations. Light therapy has proved to be effective in as many as 85% of diagnosed SAD cases. Light therapy is exposure to very bright light for up to 4 hours per day. Lumie believe that in order to effectively combat the symptoms of SAD most sufferers need light to their eyes for at least 30 minutes a day. The light must be at least 2,500 lux, which is an estimated five times brighter than a well-lit office. Therefore the light omitted from ordinary light bulbs is not strong enough. Treatment should begin on a daily basis when symptoms first appear, which for most sufferers is in early autumn. Treatment involves sitting 2 to 3 feet away from a specially designed light box, letting light shine directly into the eyes. 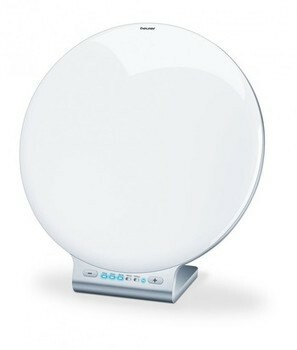 The Lumie Bodyclock is the original wake-up light, also known as a dawn simulator. 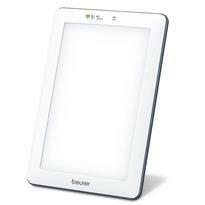 Its purpose is to wake you gradually by increasing natural light. 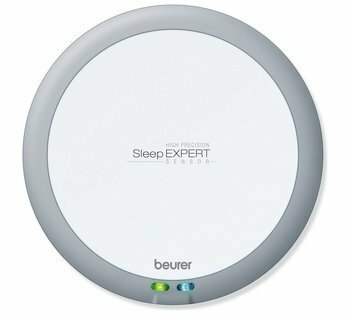 The Bodyclock GO 75 is effective for healthy sleep, energy at work, and a useful complement to a light box in treating SAD. This model of Bodyclock comes with a choice of wake-up sounds including Big ben chimes and a dawn chorus. This therapy light has been specially designed to target the effects of SAD sufferers during the short, dark winter months. The lamp uses blue spectrum CCFT (Cold Cathode Florescent Tube) tube to simulate daylight. The SAD Therapy Lamp avoids ‘spotting’ in the eyes that other LED versions can produce. The Life Max SAD Therapy Light is light and portable so can be connected anywhere where there is a mains plug for your convenience.